How can you play Fortnite on an iPad with a keyboard, mouse or controller? Sadly, that is not possible right now. However, gamepad support might be added in the future. Fortnite Battle Royale is a very popular game on iOS right now. I’ve been playing it a lot on my new iPad 2018 recently and it is a lot of fun. However, controlling it with your fingers is not as easy as using a keyboard and mouse, a gamepad, or another type of controller. 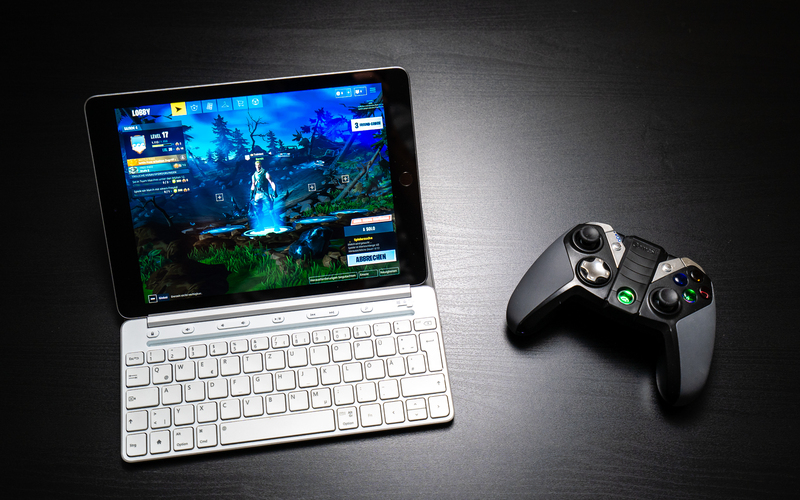 So, can you play Fortnite on an iPad with a keyboard and mouse? The short answer is no. Well, at least not right now. When releasing Fortnite for iOS earlier this year, Epic Games said they will add gamepad support in the future. But up to now, that hasn’t happened yet. And it might never happen. If you played it on your iPad or iPhone already you’ll know that it is much harder than on a PC, Xbox or PS4. Adding controller or keyboard support to Fortnite would give players without these accessories a major disadvantage. There are a lot of companies that make gamepads for iPads and iPhones. However, they cannot add controller support to Fortnite. While iOS supports gamepads, the game developer has to implement it themselves. Manufactures of gamepads are using the standard iOS control layouts and drivers. If the developer does not support it, a game won’t work with any kind of controller. That is the case with Android games as well. However, with Android being a more open platform, you might see hacks once Fortnite is released in the Google Play Store. You obviously can add keyboards to your iPad or iPhone. There are tons of Bluetooth keyboards out there that work great. As you probably know, Apple even has their own for the iPad Pro series. However, if you try to add a mouse using Bluetooth or a USB adapter you’ll be disappointed. As of now, in iOS 11, that operating system has no mouse support at all. With latest releases, Apple has optimized iOS for productivity work with adding features like drag and drop, better multitasking and gestures. These work great on an iPad and Apple clearly wants users to replace their notebook with their tablets. So, in the future, we might see mouse support. But you won’t be able to play Fortnite with a mouse on your iOS device in the near future. I’ve tried to use just a keyboard with my iPad while playing Fortnite and it does not work. Without a mouse, it is useless anyway.